Ever since I saw the first Mamma Mia! movie in 2008, I had a dream. A dream about visiting the gorgeous film locations of the movie myself. Exactly 10 years later, when the release of the second Mamma Mia! film is just around the corner, I finally made this dream a reality and travelled to the two Greek Islands of Skiathos and Skopelos. Although Skopelos is the bigger one of the two "Mamma Mia! islands", only Skiathos has an airport. Thus, you can fly direct to Skiathos and then take the short ferry ride (about 1 1/2 hours) to Skopelos. Alternatively, you can take a train and a ferry to get to the islands. I flew into Thessaloniki, took a train to the harbour town of Volos, stayed in a hotel directly opposite the port for one night, and then took the ferry from there. Train tickets can be booked via the national Greek rail website TrainOSE, and ferry tickets via ANES Lines ferries or Golden Star ferries, which now offer a direct connection between Thessaloniki and Skopelos. 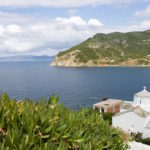 Skopelos is not an all‐year‐round destination as it can get pretty cold during the autumn and winter season. Because of this, all tour companies as well as most restaurants will be closed off season. The summer season starts in May and lasts roughly until mid‐October. Most visitors flock the island in July and August, so if you would like to escape the crowds, go in May or June or September to October. Due to its airport, Skiathos is far busier with tourists than the quieter island of Skopelos. I personally liked Skopelos a lot better because of this. I stayed at the Thea Home Hotel and felt like I've stepped right into Donna’s B&B in Mamma Mia! There were gorgeous flower decorations everywhere, a nice pool and a beautiful view over Skopelos Town and the port. 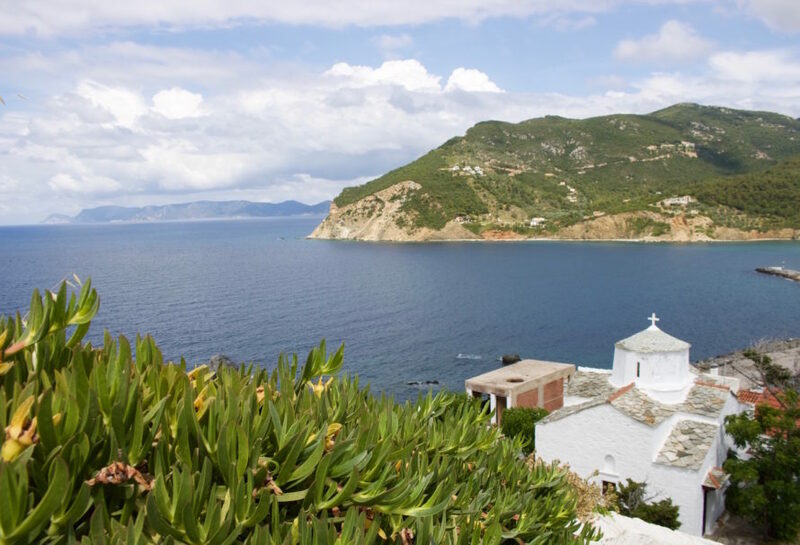 On a film‐inspired trip to Skopelos, this tour simply cannot be missed! Although scenes for the film were shot both on Skiathos and Skopelos, more film locations can be found on Skopelos. These include the "Mamma Mia! wedding chapel" and the beautiful beach that served as the backdrop for the actors performing the songs "Does Your Mother Know?" and "Lay All Your Love On Me". 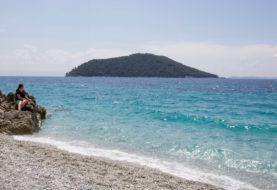 A chilled‐out beach day is one of the main summer activities here on Skopelos. Next to the port in Skopelos Town, you will find the bus stop and a timetable for the public beach bus. This bus will take you to several beaches on the island, including Kastani Beach – the main filming location for the beach scenes in Mamma Mia! At 3,80 € one way, the public bus is not particularly cheap. But therefore you will get there conveniently and don't have to worry about renting a car or motorbike. Do this if you only have limited time to spend on the island, for example if you're passing through on a cruise ship. The typically Greek, white‐washed village of Skopelos Town is located opposite the ferry port, so you won't have to go far. 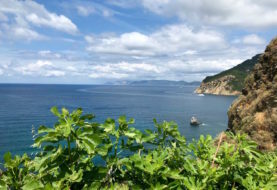 For things to do on a day visit in Skopelos Town, check out this post by Travel Blogger Brooke from World Of Wanderlust. The Vakratsa House Museum is the former home of one of the richest families on Skopelos. For 3 Euros entry, you can step back into a bygone area as everything in the wealthy household has been left exactly the way it was about a hundred years ago. There are also several dresses on show, for example a colourful, traditional engagement dress. The Molos Restaurant is located in Skopelos Town opposite the port and offers some great choices for vegetarians like me (stuffed mushrooms, grilled vegetables etc) as well as traditional Greek live music. Another good restaurant opposite the port is the International Café. Café Bar Thalassa offers a great view, although the Greek yoghurt with fruits, which cost me 7 Euros (! ), was the most expensive item on my whole trip through Greece. Disclosure: This blog post includes affiliate links to booking.com. If you click on any of these links and make a booking, I will receive a small affiliate fee, which I will use for the costs of running my website.